If the main point of the nation's influenza vaccination program is to reduce deaths from flu, then the program has failed, at least among people over 65. A growing body of research shows that because our immune systems age, flu vaccines don't work as well in the elderly - the group of people most likely to die from flu-related causes. The revelation has been so unsettling that public health officials have not shared the information widely with the public - even though some of the early findings have been a part of the scientific literature for several years now. Michael Osterholm, who directs the University of Minnesota's Center for Infectious Disease Research and Policy, Tuesday told a national conference on vaccine research that it's time to be more open about the flu vaccine and its lack of protection for the elderly. Osterholm also urged his colleagues to support attempts to create a new, effective vaccine. "These 36,000 deaths that we keep talking about with the flu, that we want to get people vaccinated for so they don't happen, really is not going to occur. And we have to be honest about that," Osterholm said. Part of the problem is that as our immune systems deteriorate with age, the same flu vaccination that causes our bodies to mount a strong immune response in our 20s, only elicits a weak reaction in our 60s and beyond. That weaker response might be enough to offer a little protection from flu in a healthy, older person. But the evidence suggests that it's not enough to actually prevent death among most of the frail, elderly people who die each year from flu-related causes. Osterholm said he knows the idea that the flu vaccine doesn't prevent deaths in the elderly sounds almost blasphemous and he admits he didn't really want to believe it at first either. But he says the new research is incontrovertible, and that data must drive health policy. "I know that some people are going to find it very challenging to basically understand that much of what we've probably done has had little impact on deaths," Osterholm said. Osterholm said that previous studies showing that flu vaccines prevent half of all deaths in the elderly population were compromised by something called known as "selection bias," meaning an error was made in selecting the people who were enrolled in the research, resulting in distorted and unreliable findings. Lisa Jackson, a doctor at Group Health Center for Health Studies in Seattle, was one of the first researchers to challenge the idea that flu vaccines prevent half of all deaths in the elderly. "Influenza only causes about five percent on average of deaths in seniors during winter months. So even if the vaccine was perfect, you could prevent only five percent of deaths," Jackson said. "So if you're showing a difference of 50 percent, there's something else happening there." The first thing Jackson did was analyze the previous studies. She wanted to see if vaccinated people had a lower rate of death during times of the year when flu viruses were not circulating. She discovered that they did have a lower rate of death during those periods too. "So that's been sort of a shocking revelation," Jackson said. Her findings meant that there was probably another factor other than getting a flu shot that lowered the risk of death among vaccinated people. Still, the findings didn't prove that flu vaccines have no effect. To test that hypothesis, Jackson conducted another study looking specifically at pneumonia deaths. Pneumonia is a common complication of severe influenza. Jackson tried to eliminate the problems that previous researchers had with selection bias, by rejecting patients who had compromised immune systems. She also reviewed patient records to make sure that her study subjects truly had pneumonia, and included people in her study that had been treated for pneumonia as outpatients, in addition to those treated in the hospital. After adjusting for all of those factors, Jackson found there was no difference in the number of pneumonia deaths between people who got the vaccine and those who didn't. "So I think we've done the best that you can do and we did not see an effect," Jackson said. Jackson's findings were not well received. Two U.S. research journals rejected her pneumonia paper, before the British journal "The Lancet" finally agreed to publish her study. In the years since, it has gotten a little easier to challenge the effectiveness of the flu vaccine as more research emerged that supports Jackson's findings. But the issue is still unsettled for some researchers. "You know if everybody says that the sky is blue, the sky is blue and then you get a paper submitted that says the sky is green, people are a little bit more, they question more and they're a little bit more reluctant," said Kris Ehresmann, who directs the Infectious Disease Epidemiology, Prevention and Control Division at the Minnesota Health Department. Ehresmann said Jackson's data is good data but it makes her job harder. "I welcome the data as a scientist," Ehresmann said. "But as someone that also does communication and public messaging, that's the part that doesn't welcome it as much, just simply because it makes it more complicated for trying to convey things to the public." Ehresmann is worried that if the data are publicized, people will think there is no reason to get a flu vaccination. She says there is strong research showing that flu vaccines are very effective among younger people. And for those over age 65, she says the vaccine likely has some effect at preventing flu - especially among healthier older people. Dr. Ed Belangia with the Marshfield Clinic in Marshfield, Wisconsin agrees. He studied vaccine effectiveness in the elderly and in children. While his research reported widely varying results, ranging from 10 percent effectiveness to just over 50 percent during a three-year period, he says it's clear that the flu vaccine is better than nothing. "None of us are saying that the current vaccine is no good or doesn't work," Belangia. "It's just that it doesn't appear to work as well as we thought and we need to look at how we can improve it." That's also the message that Osterholm took to a national gathering of vaccine researchers in Bethesda, Maryland. "The bottom line message is we need new and better vaccines that are going to work more effectively in the elderly," Osterholm said. Osterholm said there is promising work already underway to identify a new type of flu vaccine. He's part of a group of researchers looking at what it will take to make the vaccine a reality. 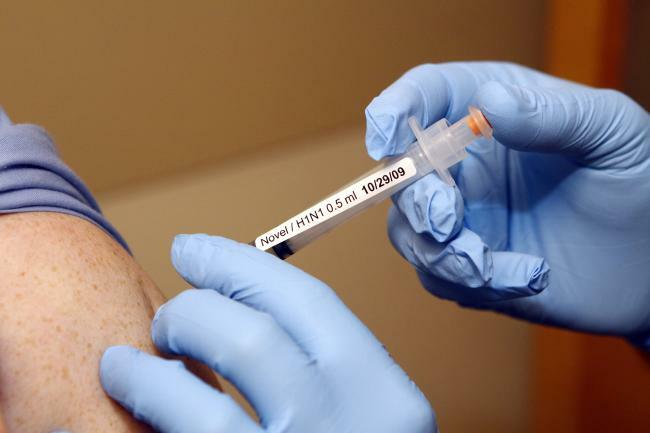 In the meantime, a new high potency flu vaccine has been approved for people over age 65. It's essentially a double dose of the regular vaccine. It will be available this fall.